We are very near the end. Again and again I am surprised to meet wonderful people along the way, struggling in their own ways for the life of the Great Barrier Reef. They contrast so strongly with the heavy industry surrounding us closer and closer as we reach Gladstone. At Raglan we stayed at the Rifle Range. The wonderful caretaker Debbie, like so many others was inspired by the idea of walking for the Reef. She maintains a hall and dongas for people who come for tournaments, and they too enjoy the beauty of the forest. Mount Larcom Showgrounds likewise are managed by an inspired woman, Evelyn. She carries on work in the small community to maintain the grounds, the Show and the community they bring together. 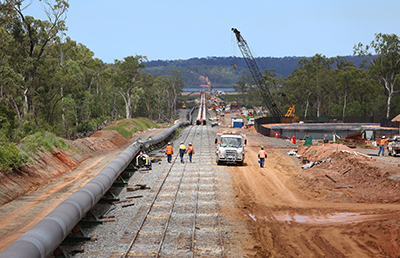 We continued along the Bruce Highway and could not miss the works underway to construct the LNG (read CSG) pipeline to Curtis Island.